The cover image above is one of those images that you see well in advance of taking them, while others are spontaneous snapshots where you barely have time to react. The title image of this post is of the first kind. I saw these gentlemen at a bus stop while they seemed to reminisce about their youth, while skateboarders zoomed around on the raised platform nearby. 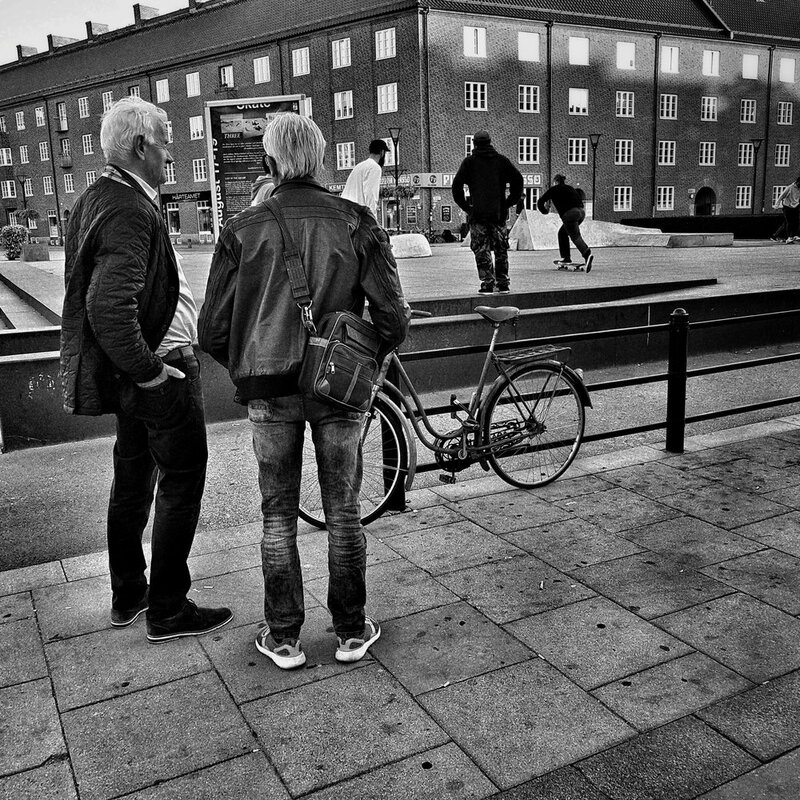 I definitely like the contrast between the silver in their hair and the youth of the skateboarders. Who knows, perhaps these two were part of the first wave of skateboarding back in the 70s? That would be pretty cool! There are days when you just have to get out there into the woods for some mental recuperation. The sun was shining after a few days of pretty bad weather, and I thought I’d head to the woods at Torup, my go-to place when I want to see some trees, if for no other reason than to capture some fall foliage. It turned out that the trees were still much greener than I thought they’d be; not at all as yellow, brown or red as I had expected. That was okay though, just being underneath these huge trees was reviving in itself! I am not much of a flower photographer, but sometimes even a blind chicken can find a seed (as the direct translation of a Swedish idiom goes). This picture was taken at the gardens of the Agricultural University at Alnarp, not too far away from where I live. 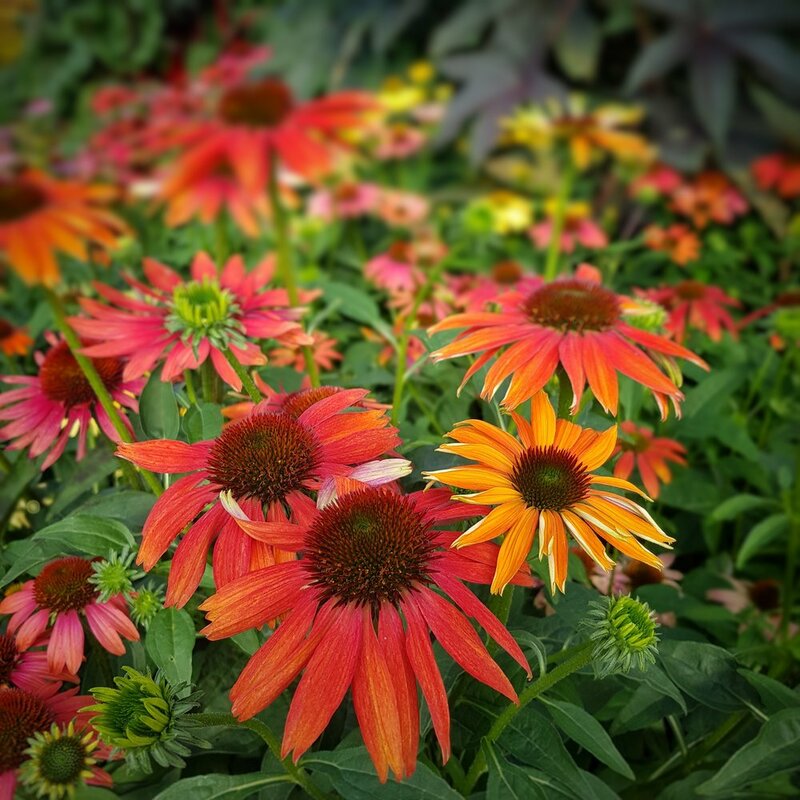 In the spring there is an enormity of color when most of the bloom occurs, but even as late as September there are still lots of colors left, especially this year when it’s been so unusually warm. One of the ways you can experience the city of Malmö is by boat on the canals, either via the guided tours on the “Rundan” boats, pedal boats or via electric “rent-a-boat”. A few of us from the Malmö Photographic Society decided to pool together some cash and rented a boat for a trip around the waterways of our city. It was an interesting way to see the city from a viewpoint I’ve not really seen before. It was just a pity that the weather was very soggy for the majority of the boat ride. But hey, I didn’t fall in…or get seasick, so that’s a plus! Some days the weather and time of day work together to bring you an astounding view, and this picture is an example of this. It had been raining like crazy all day, but just before the sun would set for the day the clouds opened up just enough to give me this view, if only for a few minutes, before they closed down again. This is a pretty rare sight, my brother’s dog Molly on my mother’s lap. It’s not that she doesn’t like her “grandma”, quite the contrary (that dog likes just about everyone). It’s just that my mother is shorter than most of the family so her lap isn’t as comfortable for the dog as it is to snooze on for instance my lap or my brother’s. But I guess on this day she preferred grandma…which was a good choice! I feel very lucky that I can head to the ocean, since it is very close to where I live. On a day like the day I took the cover image for October it definitely felt very good to be out there! The image is taken at Bjärred and the Long Jetty that leads to a bathhouse/restaurant that is many hundreds of feet out into the ocean (it’s hidden by the railing on the right hand side in this picture). In the background you can also see the Bridge between Sweden and Denmark, something that you can see from any beach on the west coast of this province, at least for many miles away from the Bridge. Day 281 - October 8: Did I bring enough cameras? A very beautiful late 19th century building in Varberg that is a bathhouse. It’s located right in the harbor, and no doubt it’s a pretty busy place during the summer season. In October though it was pretty empty, even though I did see a few patrons come out of the dressing rooms into the cafe that is also located in the building. The hot beverage definitely felt good on a chilly, but sunny October day! This picture is perhaps more of an editing experiment than a particularly good photo. It’s been through Snapseed and a lot of stuff has been done to it, to make it look like I’ve taken a picture of very fast moving people (if I’d taken this with my analog gear I think I could make it look like this in camera, but the Samsung phone camera is a bit too good for that…so I had to “help” it a bit. 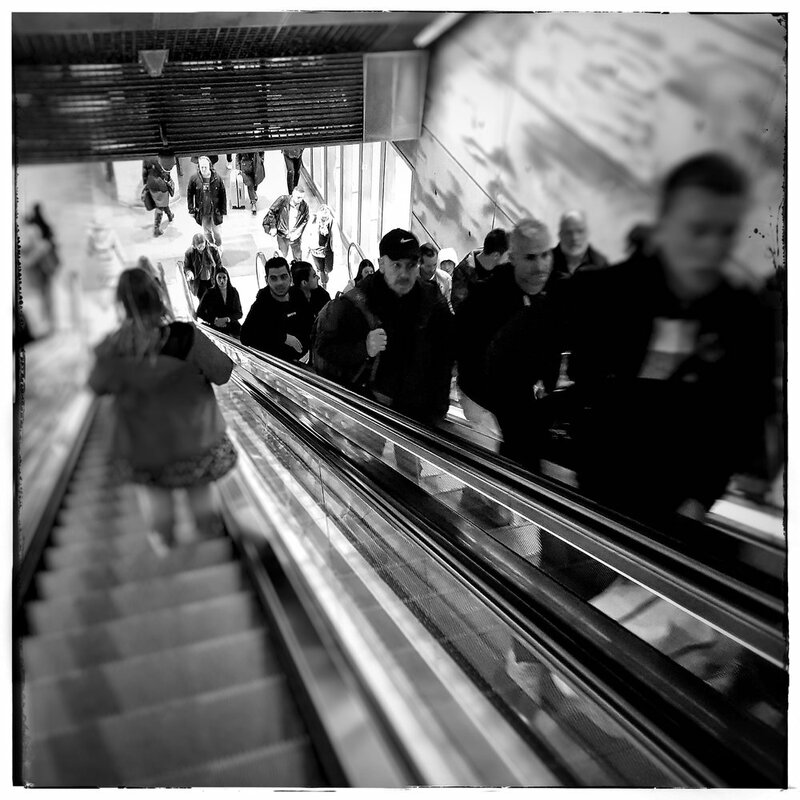 Still, I think I managed to convey the impression of a mass of people moving up the escalators. I guess you never get too old to kick up autumn leaves…this is my dad on one of our many photographic expeditions. On this one though, his camera had decided that it no longer wanted to cooperate, so we were left with just my cameras for the day. In the end he didn’t shoot much (he’s not into analog photography like I am), but it was still a lovely day out. There are times when you’re just glad that you have a camera (in this case the phone) with you, so you can take a picture of something that fascinates, captivates or just plain amuses you. This was a case of the latter, because this kid was pretty funny as he walked around with his dad’s jacket on his head like a makeshift cowl. I had to be a bit sneaky with the phone camera for this one, because there are some stores that aren’t too fond of people snapping pictures in them (especially candid shots of strangers). Still, I like it. Also, it was a fun way to “celebrate” the 300th picture of the year.